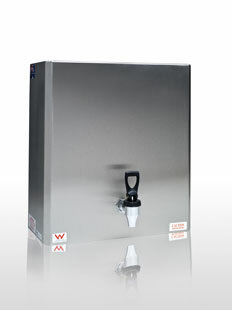 The Boiling Billy wall mounted boiling water units will provide piping hot water for tea, coffee when you don't want to stand around and wait for the kettle to boil it is perfect for offices, tearooms, canteens, schools, hospitals, social clubs, homes and any other areas which require boiling water when you need immediate hot water. This energy efficient hot water heater is easy to install and maintain. The Boiling Billy Economy series wall mounted boiling water units are perfect for providing boiling water for tea, coffee and all hot beverages and is perfect for offices, tearooms, canteens, schools, hospitals, social clubs, homes and any other areas which require boiling water. Wall mounted hot water heater with tap and fixtures.